Collecting New York State OA, one patch at a time. To share information about new or newly discovered Order of the Arrows patches, flaps, odd-shapes, neckerchiefs, event and chapter issues from New York State Order of the Arrow Lodges, warnings about fakes, spoof, and reproductions and any other information that may be of interest to New York State OA Collectors. Issue Numbers are subject to change as I become aware of new issues, errors or omissions in listings. More to come soon. I'm pedaling as fast as I can. Mike Conkey had asked the for some information on Patch-L about a neckerchief slide he had acquired. Good Morning! I need some info on a neckerchief slide I picked up and hope the wisdom of the list can help. It is pewter and arrowhead-shaped. Has an arrow (pointing up to the left as you look at it). 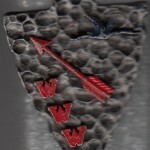 On top of the arrow is a turtle, below the arrow is “WWW”. Probably from the 1970’s – 1980’s timeframe. Was this a National issue, or does it belong to some “turtle-ish” lodge like Unami? I replied that it seemed to be one of the slides I had previously discussed in my series on neckerchief slides. Sounds like you have a pewter “Totem slide” made/sold for years (going back well into the 1960’s) by Grey Owl (Grey Owl Indian Craft Co.,Jamaica, NY 11434). Their old mail-order catalogs listed a generic arrowhead-shaped pewter slide with arrow and “WWW” to which could be affixed one of serveral dozen different totems. As there were so many lodges that used a turtle for a totem, this is one of the more common ones. These were very popular in the 1960’s and into the 1970’s, though I’m not sure when they were discontinued. appear to have broken off easiy). The oldest one I’ve seen is made of brass or bronze with a circular slide ring of steel painted black. Only the later variety carried any markings: “TOTEM SLIDE” in raised lettering on the back. interested in hearing if anyone has seen any others bearing a lodge name or number? 305 sold this style with a beaver design attached. 336 also sold this design with a ram’s head in profile. What other ones are out there? I don’t know about most people, but my books overflow the shelves and tables and end up every flat surface in the house and office. There is a certain comfort knowing there is always a new book to read, a reference tool to consult, an author to experience, knowledge to gain. You cannot have too many books to consult, savor, and read over and over again. What item in your collection means the most to you? New York State Order of the Arrow Patches. Daily Links – What I’ve stumbled on in my readings. There was a problem with your feed! The error is A feed could not be found at http://delicious.com/v2/rss/billmul. A feed with an invalid mime type may fall victim to this error, or SimplePie was unable to auto-discover it.. Use force_feed() if you are certain this URL is a real feed. Most Expensive OA Lodge Event Patch? Amazon orders that begin with clicks here, regardless of what you ultimately order help support this blog at no cost to you!